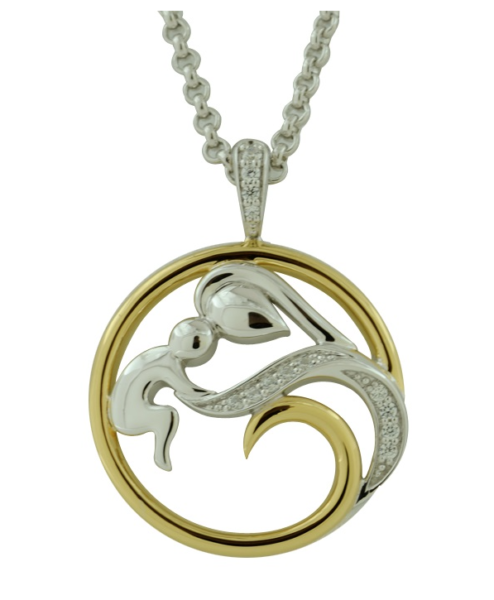 Belle Etoile Infinite Love Pendant Makes a Beautiful Mother’s Day Gift! The limited edition Infinite Love pendant by Belle Etoile is the perfect gift for Mom! Featuring a nature-inspired scene of a mother lovingly holding her child, Infinite Love by Belle Etoile symbolizes the special bond of heart and mind between mother and child. Adorned with glittering stones set in sterling silver and 24K yellow gold vermeil with a retail value of $195, the Infinite Love pendant comes with a free 18″ diamond-cut sterling silver rolo chain ($50 value).